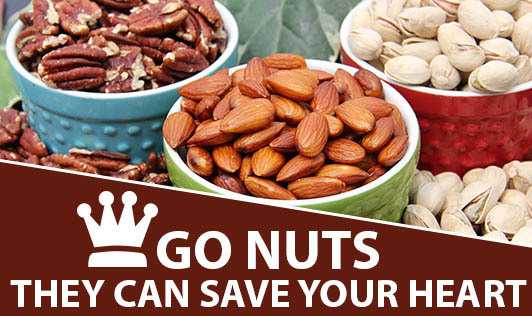 Go nuts- They can save your heart! Late last year, the British Medical Journal printed a study on frequent nut consumption and the risk of coronary heart disease in women. This study which ran for a number of years from 1980, was conducted on over 86,000 women from 34 to 59 years of age, who had not been diagnosed of coronary heart disease, stroke, or cancer. It concluded that frequent consumption was associated with a reduced risk of coronary heart disease and heart attack. In other words, if you eat nuts frequently, you have less chance of getting heart disease. A study conducted some years ago on Seventh Day Adventists concluded similarly that those who consumed nuts frequently experienced fewer fatal coronary heart disease events and non-fatal myocardial infarctions when compared to those who consumed nuts less than once a week. Though nuts have been a part of Indian cuisine for decades, they have acquired a bad reputation amongst the calorie-conscious because of their fat content. Use of nuts is a definite no-no for the dieters. However, nuts are not made of fat only! They contain several other nutrients which can be useful for the body. The most widely used nuts in India are coconut, groundnut (peanut), almond, cashew nut, pistachio nut, and walnut. These nuts give anything from 444 to 687 calories for 100 g. More than half of these calories come from fat. The remaining calories come from protein and carbohydrates in almost equal quantity Apart from coconut, which has less protein, the others contain about 15 to 25 g of protein, with groundnut being the highest. Plant protein is now believed to be better than animal protein. Almond is exceptionally high in calcium and phosphorus, both of which are required for good bones, teeth, and muscle contraction. Almonds when taken regularly help in maintaining the smooth function of the brain, nerves, bones, and liver. Groundnut scores the highest in niacin and folic acid content. Both belong to vitamin B group. Niacin is important in the break down of carbohydrates, proteins, and fats while folic acid is required for the red cells in the blood. Recent studies have shown that folic acid helps to control homocysteine levels in the blood, which is a risk factor in heart disease. They are easy to carry and can be used as quick energy-boosting snacks. They can be used as garnish in cooked dishes or in salads to give a crunchy taste. They can be eaten in their natural form. They can be used for more nutrition instead of the oil. For example, leave out the groundnut oil and eat groundnuts instead.